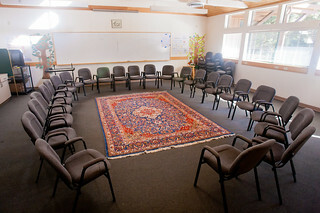 Bosch Baha’i School is available to rent (usually September to June depending on availability) to nonprofit, educational, and/or service-oriented groups for meetings, seminars, and overnight retreats and trainings. We have capacity for 80 guests in 30 cabins/rooms with varying numbers of beds. 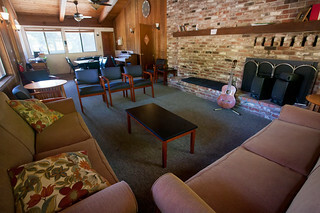 Please see our Accommodations page for more information. For large conferences, Bosch has a meeting hall, which can comfortably accommodate up to 175 guests. We offer a lectern and wireless microphones for our presenters, as well as a performance stage, a baby grand piano, microphone inputs, and a sound-mixing room. An equipped sound-proofed nursery is available for our younger guests. 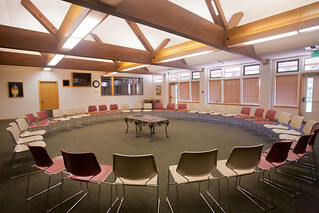 For smaller groups of up to 40, Bosch has 3 seminar rooms, each equipped with white boards, wireless internet and computer projectors upon request. Note: Bosch does not allow smoking, tobacco products, e-cigarettes, or alcohol use on its campus or in any of its facilities. For complete details, including cabin and room types, deposits, payment options, our latest rental standard fees and for information on availability and minimum number of guest/meeting-attendee requirements, please call 831-423-3387or email bosch@usbnc.org.